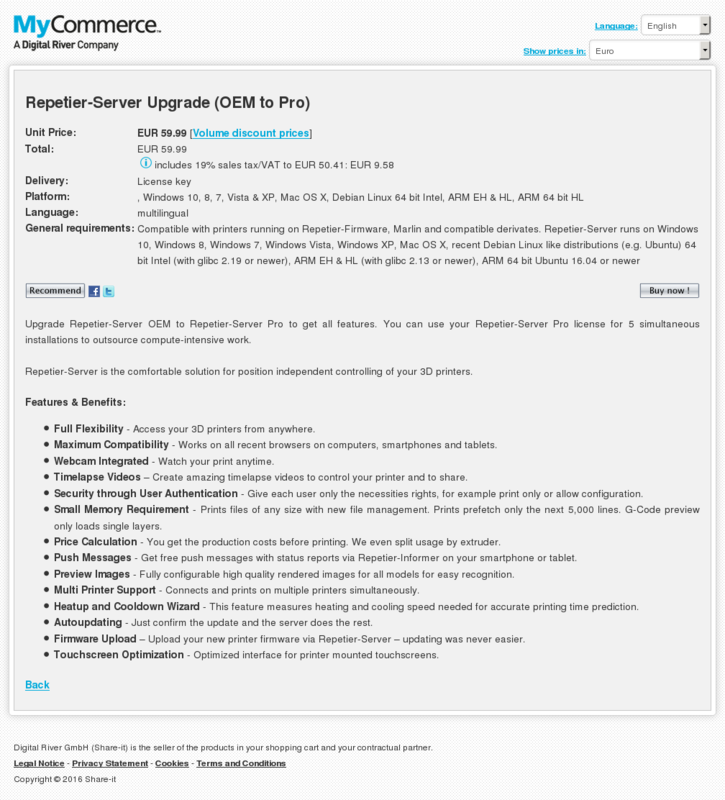 Upgrade Repetier-Server OEM to Repetier-Server Pro to get all features. 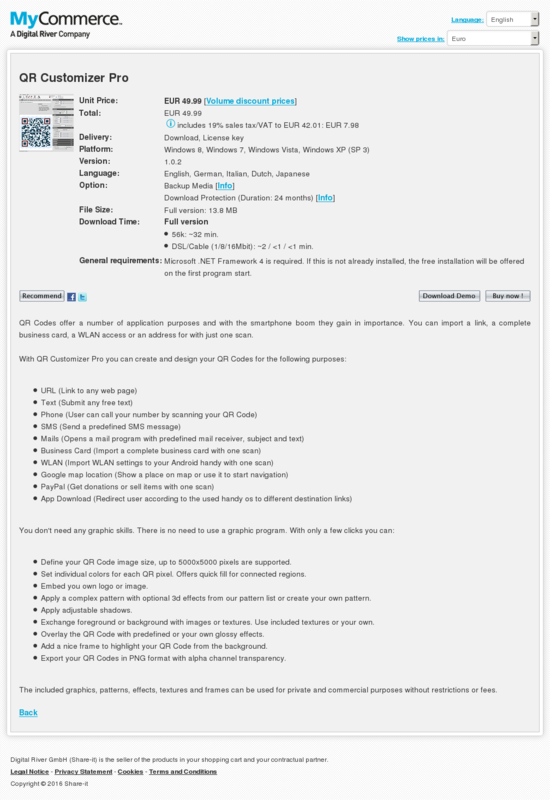 You can use your Repetier-Server Pro license for 5 simultaneous installations to outsource compute-intensive work. Repetier-Server is the comfortable solution for position independent controlling of your 3D printers. 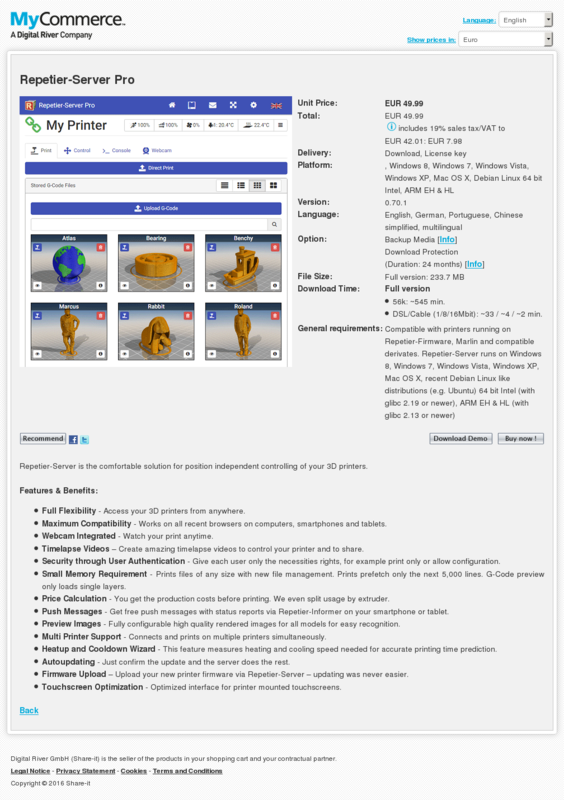 Full Flexibility – Access your 3D printers from anywhere. Timelapse Videos – Create amazing timelapse videos to control your printer and to share. Touchscreen Optimization – Optimized interface for printer mounted touchscreens. DSL/Cable (1/8/16Mbit): ~33 / ~4 / ~2 min. 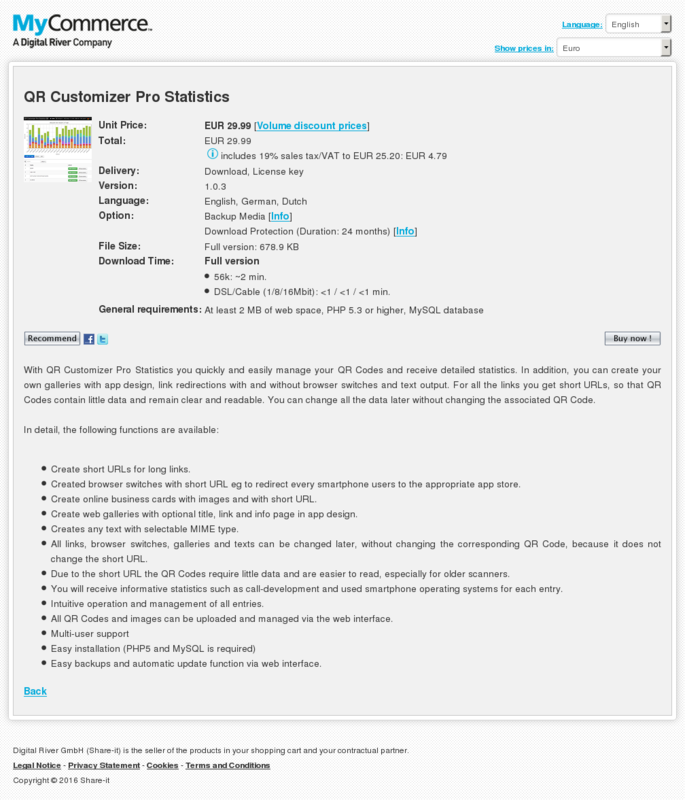 With QR Customizer Pro Statistics you quickly and easily manage your QR Codes and receive detailed statistics. In addition, you can create your own galleries with app design, link redirections with and without browser switches and text output. For all the links you get short URLs, so that QR Codes contain little data and remain clear and readable. You can change all the data later without changing the associated QR Code. Create short URLs for long links. Created browser switches with short URL eg to redirect every smartphone users to the appropriate app store. Create online business cards with images and with short URL. Create web galleries with optional title, link and info page in app design. Creates any text with selectable MIME type. All links, browser switches, galleries and texts can be changed later, without changing the corresponding QR Code, because it does not change the short URL. Due to the short URL the QR Codes require little data and are easier to read, especially for older scanners. You will receive informative statistics such as call-development and used smartphone operating systems for each entry. Intuitive operation and management of all entries. All QR Codes and images can be uploaded and managed via the web interface. Easy backups and automatic update function via web interface. QR Codes offer a number of application purposes and with the smartphone boom they gain in importance. You can import a link, a complete business card, a WLAN access or an address for with just one scan. Define your QR Code image size, up to 5000×5000 pixels are supported. Set individual colors for each QR pixel. Offers quick fill for connected regions. Embed you own logo or image. Apply a complex pattern with optional 3d effects from our pattern list or create your own pattern. Exchange foreground or background with images or textures. Use included textures or your own. Overlay the QR Code with predefined or your own glossy effects. Add a nice frame to highlight your QR Code from the background. Export your QR Codes in PNG format with alpha channel transparency. The included graphics, patterns, effects, textures and frames can be used for private and commercial purposes without restrictions or fees.